To Hozat and Ergen Armenian Church. Due to the early start in Tunceli I was in my room by 9.45am. However, I was out again by 10.15 with my bottle full of water taken from a tap in the spacious bathroom (today I would fill the bottle on many occasions, but was impressed that many places existed to allow me to do so). My destinations for the day, provided everything went to plan? Hozat, from where I wanted to visit the ruined Armenian church in or near the village of Gecimli (in some sources the church is misleadingly said to be in In, but In is about 3 kilometres before the church. Ergen is another name used to identify where the church is. I assume Ergen is the old name for Gecimli), and Cemisgezek, a town with a number of important monuments surviving from the past. Cemisgezek is also rumoured to have interesting old houses, but how many have survived to the present day I could not establish from afar. 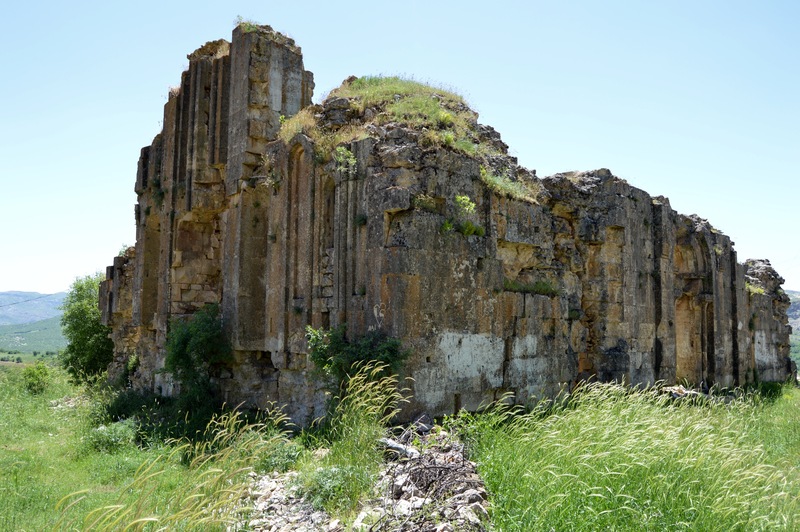 Knowing that to get to the ruined Armenian church from Hozat would probably involve a time-consuming walk along a road devoid of traffic, I hoped to access Hozat first, but I would allow the destination of the first lift to determine precisely the day’s programme. I walked north from the hotel for about 1.5 kilometres to a roundabout where a right takes you to modern Pertek and a left to Hozat and Cemisgezek. 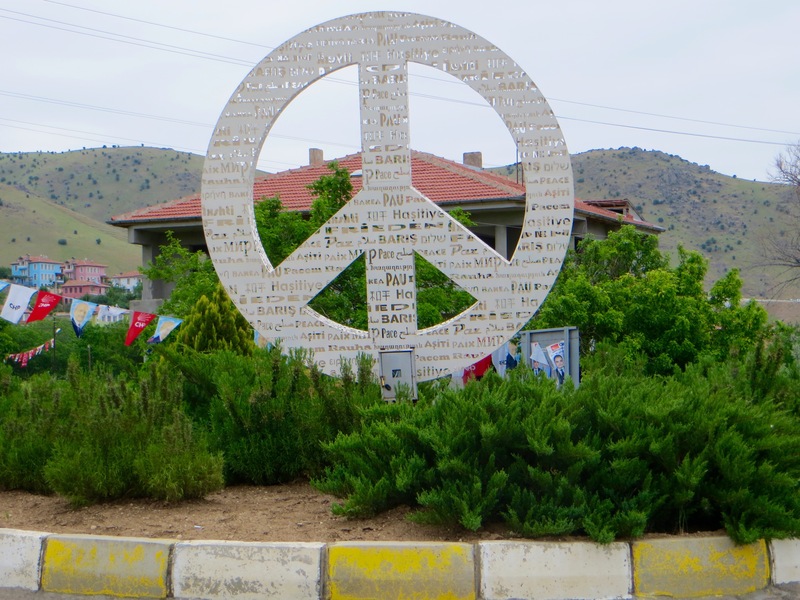 The roundabout has at its centre that widely known sign of peace inside a circle first popularised by the anti-nuclear weapons’ movement, and on the sign the word “peace” is written in many different languages. I had been at the roundabout for only five minutes when a minibus came down the gently inclined hill from modern Pertek. I flagged down the minibus and was told it was going to Hozat. Perfection. At first the road clung to the shore of the reservoir, but, once we had passed the turning for Sagman, a village I would visit the next day, it almost immediately began to ascend into the rounded hills from where there were extensive views over the reservoir and toward distant mountains. For the rest of the day I spent almost every moment in glorious upland scenery, sometimes surrounded by mountains and sometimes with the vast reservoir in view. From the scenic point of view, this was to prove perhaps the most rewarding of all days on the trip. It is true that the scenery in Munzur Vadisi Milli Parki is more spectacular and enchanting, but what I encountered today was more extensive. Moreover, there were times when the scenery assumed quite an austere, even forbidding, character because trees were sometimes absent from view and rainfall in the region less frequent than further north and east. Suffice it to say that I was in remarkably beautiful upland scenery different in character from that in the milli parki, and in many places I encountered fields, orchards, pasture, wild flowers, large herds of cattle, very large herds of sheep and goats, many small settlements in which I would have liked to spend some time (some such settlements lie along the roads, but more often they are some distance from and above them) and, yet again, very friendly and helpful people. Moreover, later in the day, as the sun began its descent toward the horizon in the west, the visibility assumed a clarity of exceptional quality. What more could anyone ask for? 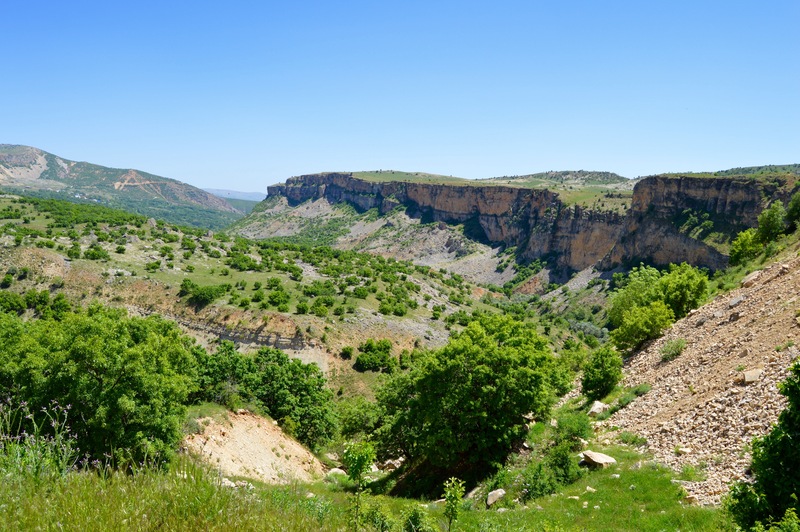 The road to Hozat splits from the one to Cemisgezek at a hamlet between Dorutay and Akdemir and very soon enters a valley narrower than many in the area. The ascent to Hozat is gradual but consistent and the mountains of the milli parki lie to the north. The closer we got to our destination, the more the scenery recalled that of the milli parki and the Ovacik area. We arrived in Hozat, a small town on a gently inclined shelf above the valley the road has ascended. 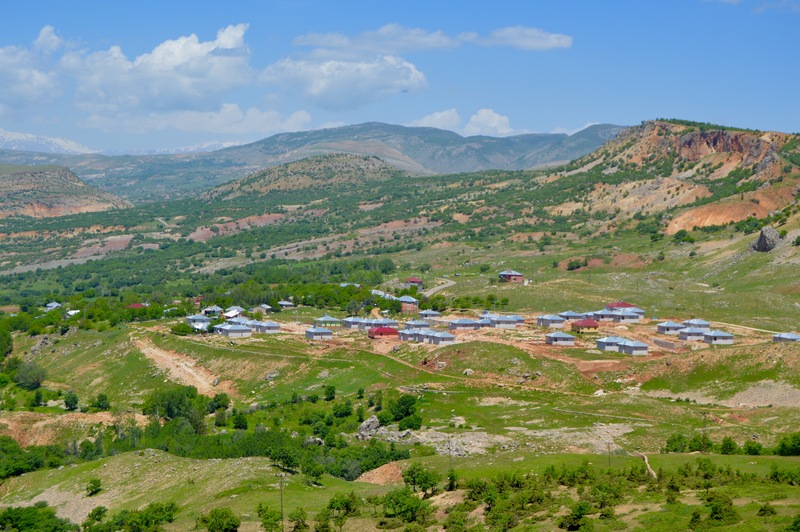 With mountains around it no one can fault its attractive surroundings, but Hozat itself is overwhelmingly modern and virtually indistinguishable from a thousand Turkish towns of similar size. By now I had been befriended by an Alevi couple with a remarkably liberal disposition who had travelled on the minibus since it left Pertek. 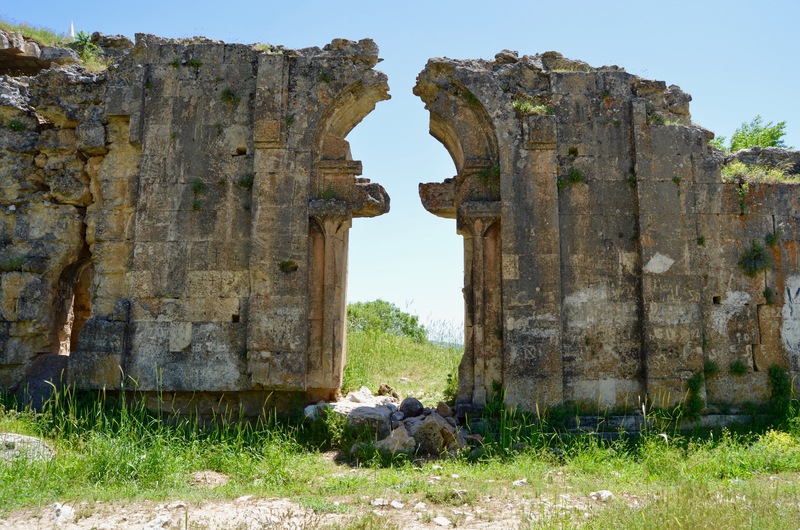 The couple not only explained that Hozat was overwhelmingly Alevi, but helped me get to the ruined Armenian church. They had to visit some people in a village near the church. We retired to a tea house for glasses of tea and a cup of coffee each, and a few phone calls were made. A few people came and, after a short chat, left, then, about half an hour later, we climbed into a minibus driven by a man aged about twenty-five. 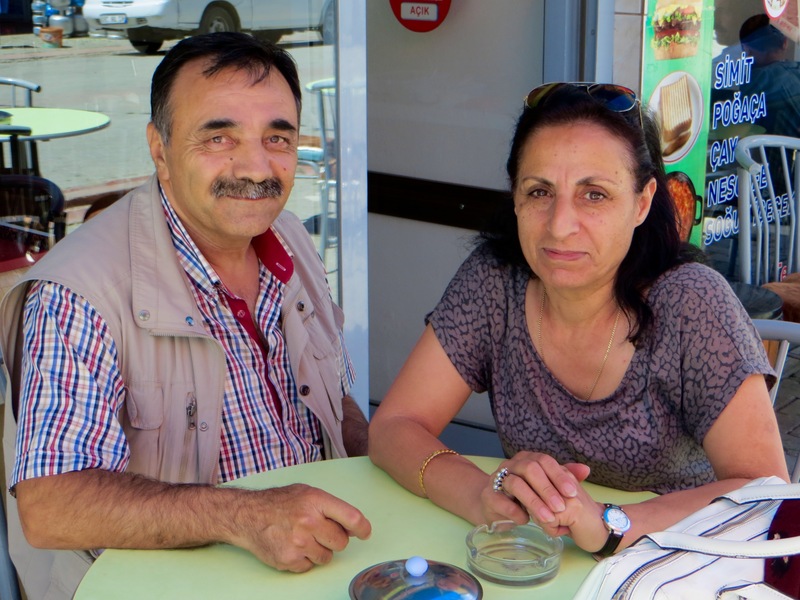 The Alevi couple stopped the minibus not long after it had set off to buy fruit, vegetables, cheese and bread, supplies for the people they wanted to see in what had to be a village devoid of shops. We drove about 2 kilometres along the road toward Pertek, then took a left along a road that crossed the river and meandered along the east wall of the valley. 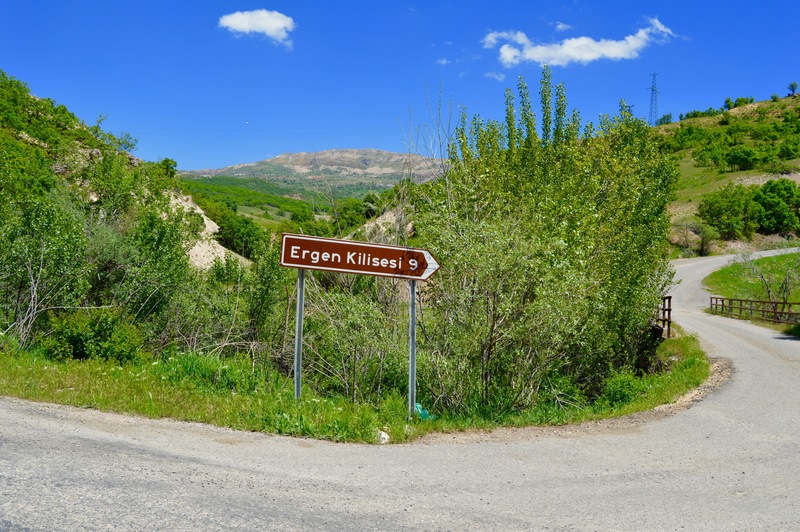 Most unusually, a sign beside the road junction indicated that Ergen Kilisesi lay 9 kilometres away. 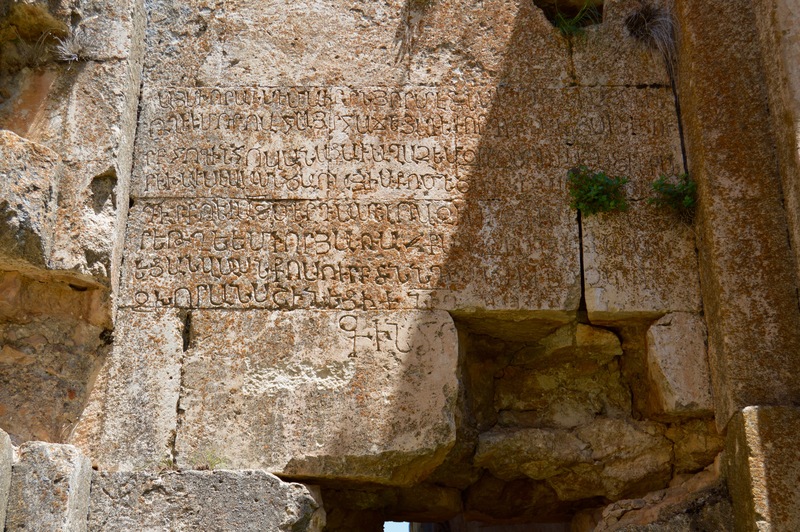 In ninety-nine out of a hundred cases, minor Armenian ruins of this nature in Turkey are not signed for walkers or passing motorists. The only explanation I can give for this exception to the rule is that I was in Dersim where all minority communities have been brought together in a spirit of comradeship by decades of secular and Sunni Turkish oppression. At times the road ascended to a considerable height and the views were outstanding. After driving perhaps 7 kilometres we took a left and ascended into a very small settlement on an exposed hillside. The minibus drew to a halt outside an old stone house with a flat roof with rooms arranged on only one storey. 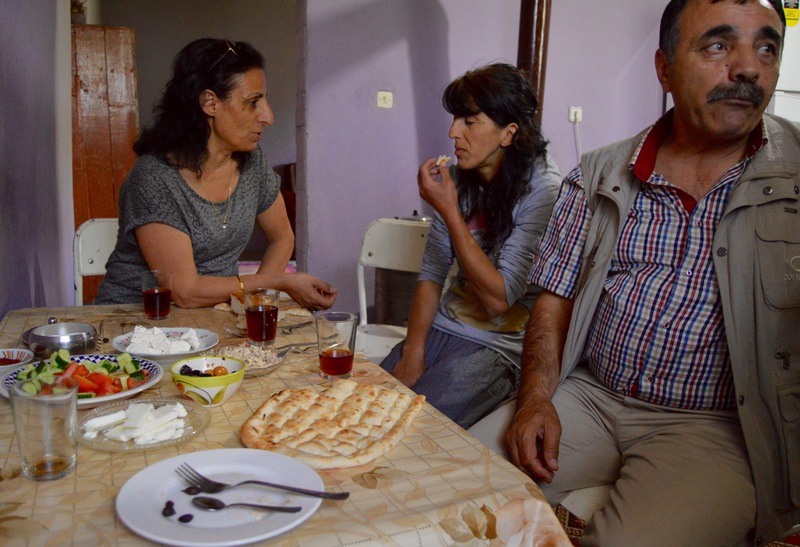 We had arrived at the house of the friends the Alevi couple wanted to see. Their male friend, a tall and hyperactive individual aged about forty, lived with his partner aged about thirty-two. The couple were unmarried, which is most unusual in Turkey, even in urban centres such as Istanbul, Ankara, Izmir and Bursa which think of themselves as being very liberal and progressive. Between Hozat and Ergen Armenian Church. Although the couple in the house had installed in recent times some kitchen units and a new fridge and cooker, they lived a very simple life in the hills and, but for a TV and a few electronic gizmos, had little more than any family might have that depended on agriculture to make a living (although there was an impressive collection of bottles with alcoholic drinks on a cupboard in the hall). In fact, their main source of income seemed to be sheep and goats, many of which were temporarily confined to a rectangular enclosure of dry stone walls covered with a large blue sheet made of artificial material no doubt designed to protect the flock from the sun. But what really confirmed I was in the company of a couple living an unconventional lifestyle by Turkish standards was a poster of Ibrahim Kaypakkaya hanging on the dark-coloured plaster wall of one of their rooms. In fact, I was in the company of communist sympathisers who have chosen to live their lives, for now at least, far from the madding crowd, and, in the process, far from the prying eyes of the police and other uniformed representatives of the Turkish state. Little things during the hour or so that followed suggested to me that both had strong sympathies for the PKK and that the male half of the couple may have fought on its behalf (the woman may have done so as well, for all I know). As for the young woman, after she had prepared for us a wonderful lunch of mild white cheese, olives in a herb and oil dressing, tomatoes, cucumber, helva, butter, bread and tea (the tomatoes, cucumber and bread had just arrived from Hozat, of course, but the cheese and butter, both of which were of remarkable quality, were locally sourced), she pecked at her food, rolled her own cigarettes with tobacco grown in the Adiyaman area and discussed things as an equal with everyone else. However, not once did she smile. She looked all the time as if the problems of a blatantly unjust world, a world in which the oppression of those least equipped to care for themselves was almost universal, were always at the forefront of her mind. Wearing shalwar, a grubby top and no headscarf or make-up, her slim frame and diminutive height were apparent to everyone present. Handsome rather than pretty, it was nonetheless difficult to take your eyes off her. If her hands were not engaged in movement, she would prop first one foot and then the other onto the seat of her chair and exhale smoke by lifting her face to the ceiling, thereby allowing some of her long hair to fall from her shoulders down her back. Lunch near Ergen Armenian Church. Suddenly it was time to go. I managed to take photos of the couple, although it was obvious that neither he nor she were at ease with me doing so (which confirmed for me that they were keen to be as inconspicuous as possible. It was obvious they were radically opposed to religion in any shape or form, so a Sunni Muslim suspicion about photographing a female was not the explanation for their concern about my wish to immortalise one half of the couple), and the farewells were warm and heartfelt (they could detect that my sympathies lay with the left, but I did not express sympathy with communism, which all too often simply replaces one tyrannical regime with another). The young man got ready to drive off and the Alevi couple who had befriended me in the minibus from Pertek climbed aboard, as did I. 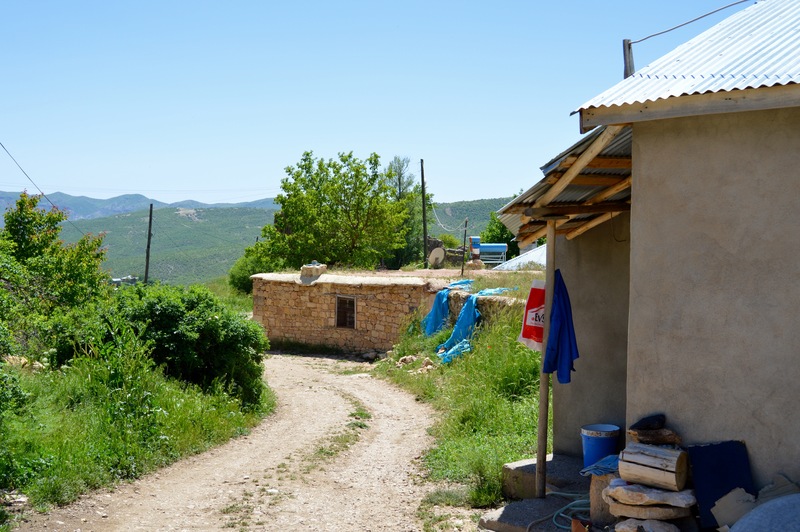 We drove to the road leading to the Armenian church and, after about 3 kilometres, arrived in the village of Gecimli. The minibus was driven into the large garden attached to a house in the centre of the village and the man who had done the driving explained that the house belonged to his family. I met the man’s mother and father and was then told that the church lay only 200 metres further along the road. After I had looked at the ruin I was to return to the house from where I would be driven back to Hozat. As I walked toward the church through yet another village in which I would have liked to spend more time, I had to fight back a few tears. 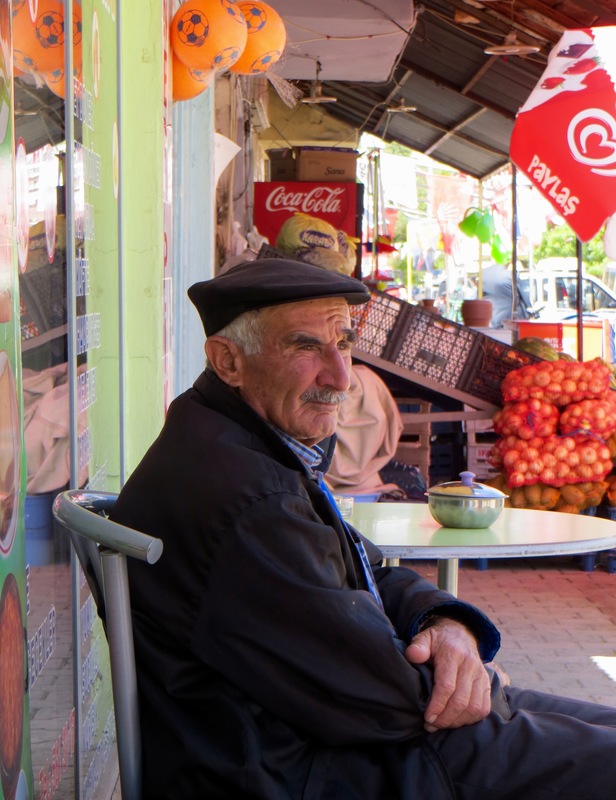 Hospitality among the people of Dersim is of a quality I have never encountered before, even here in Turkey, where, in my experience, hospitality exceeds that encountered in any other nation state I have visited. 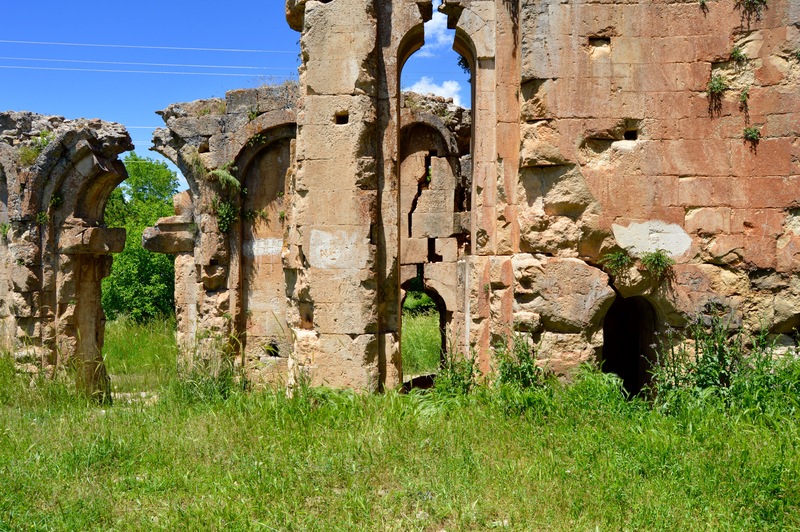 The church, which was dedicated to the Holy Virgin, and probably the whole monastery (that of Surp Karapet, or John the Baptist), was founded in 975/6. This was about forty years after the Byzantine conquest of the Dersim and the Lower Euphrates valley. 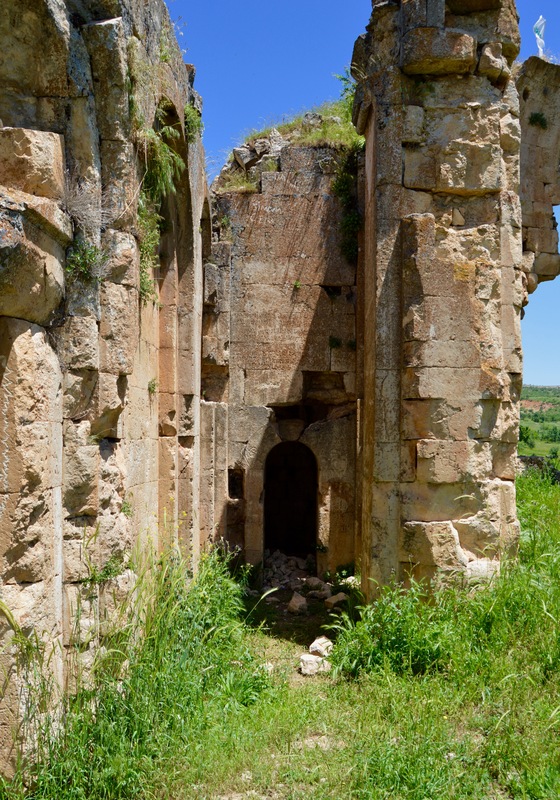 The monastery came into prominence in the early 15th century, when the Armenian and monastic church revival in Amid (Diyarbakir) and its district seems to have affected this area. It was probably in the 1420s that the church was overhauled: it was certainly refaced on the exterior, and the roof and vaults were probably rebuilt. The monastery was active during the whole of the 16th century. It is not clear when it was abandoned, but it was certainly empty by 1865 and the final abandonment may have taken place in the 18th century. Local tradition suggests some serious robbing of the stone in 1944, possibly in order to build a school – but this point needs clearing up by looking at the school. There is an apsed chamber, n. of the apse, at the e. end of the northerly aisle. The chamber’s entrance is rather darkened and partly hidden, as if at the end of a corridor, by a short wall extending westward from the end of the apse wall. 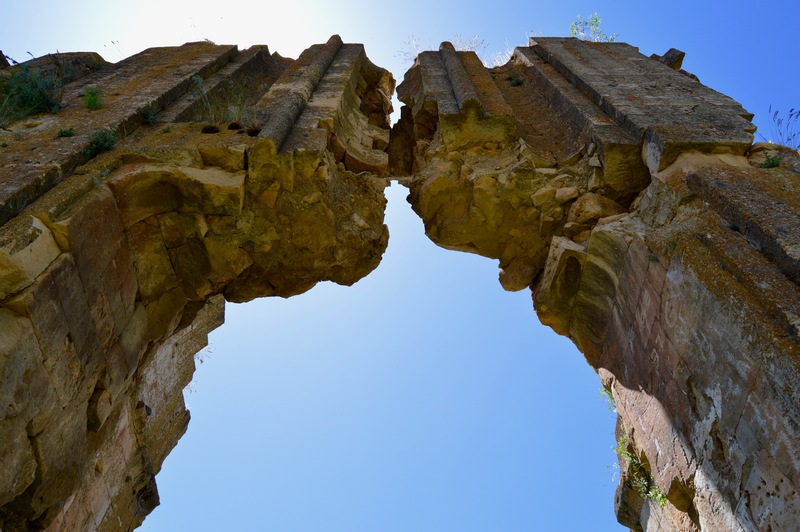 The wall consists of a short blind arch and the pier from which the first arch is sprung. E. façade. 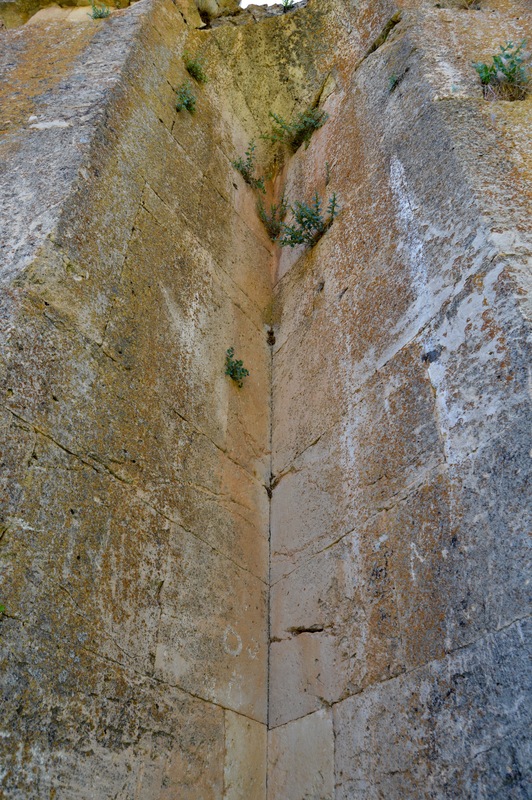 Here the triangle of masonry between the apse and the two side-chambers is partly carved out in two wide V-shaped niches. The apse was lighted by a double window whose sills were at head height: however, the windows’ frames have been lost, apart from the outer vertical member of the r.-h. window. 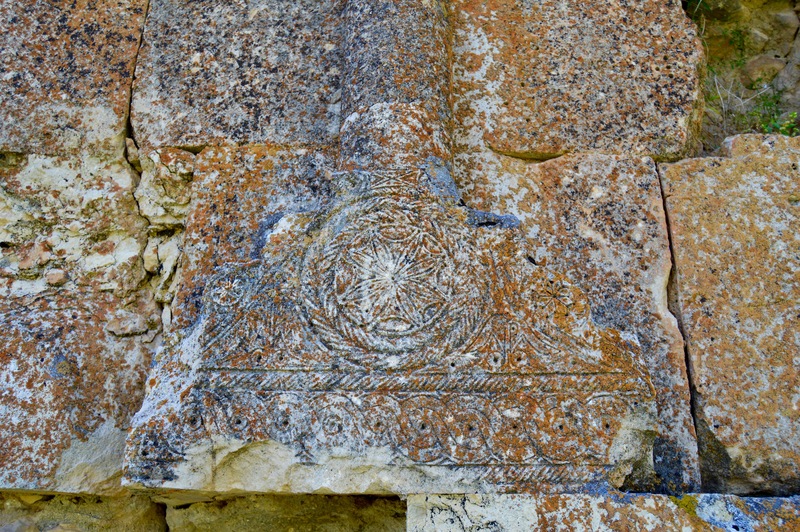 Here we can see a line of rosettes and other designs inside circles joined by knots… The composition centring on the window in the apse of the northerly chamber is reasonably complete. The window is flanked by tall panels. Engaged pillars rise between the panels and the window, and provide the support for the arches covering each of the three. Each pillar rises out of a sculptured element resembling a stepped base, which is probably modelled on a stele base. These bases bear very shallow decoration. 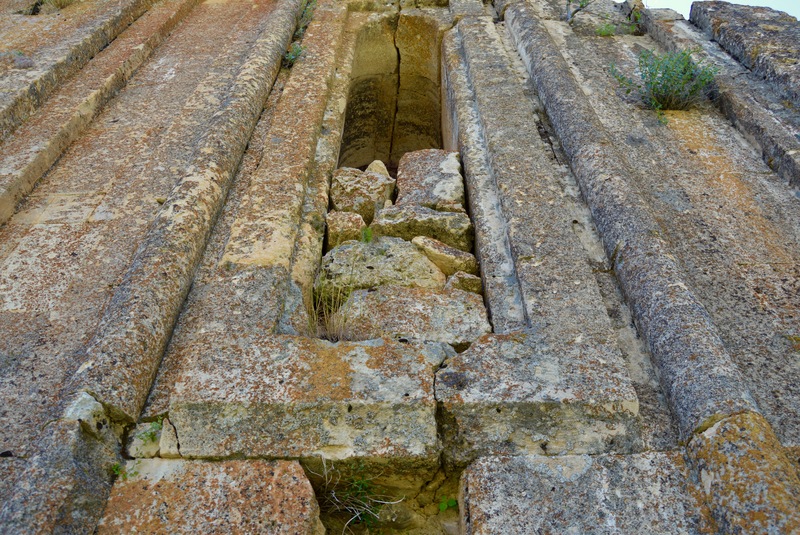 One of the bases for the two engaged pillars which rose between the apse’s windows is left. Here five arches are deeply carved in the face of the base. I have quoted extensively from Sinclair because, although not everything he saw in the 1980s survives, the church is still such a notable survival from the past that people should know what has already been lost, and what could very well be lost in the future if the ruin is neglected for much longer. 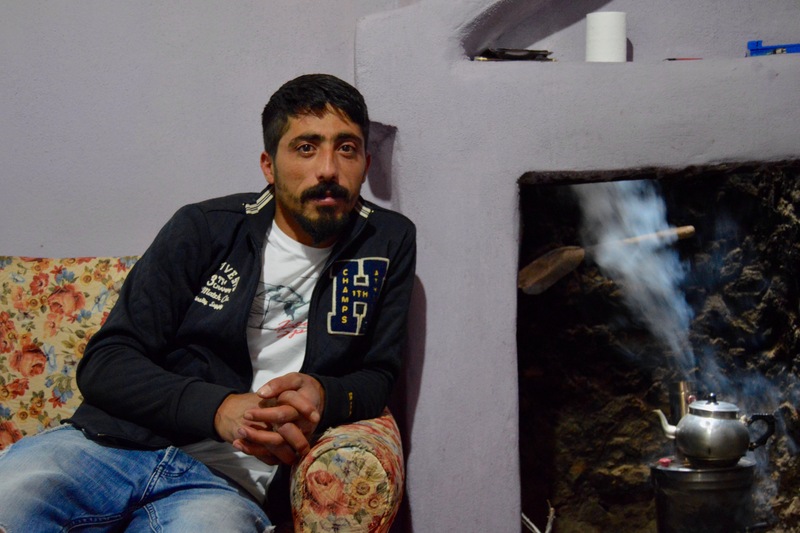 I returned to the house where the minibus had been parked and, after brief chats with everyone present, said goodbye with particular regret to the couple who had befriended me on the minibus from Pertek to Hozat. The young man ushered me into the front of the minibus, picked up a friend who wanted a lift to Hozat, and, after exchanging the V-sign with a few males gathered around an electricity pylon, we left for the main Hozat to Pertek road. The scenery along the dirt and gravel road all the way to the junction looked even more enchanting (especially because we were looking north toward the mountains around Ovacik), not least because I had attained the day’s first goal and it was only just after 1.00pm. I decided to risk a visit to Cemisgezek, even though I would probably have to rely on hitched lifts both ways. We arrived at the main road and I thanked the driver for everything he had done on my behalf. I offered to pay for at least some of the petrol he had used, but the money was waved away with an expression of mock anger. Not for the first time on the trip I could feel a tear or two welling up. I began walking south and was soon ascending to a rounded summit with pasture and wild flowers from where I could see many kilometres in all directions. With the views changing very slowly, I could appreciate the landscape even more than in a car or a minibus, not least because nothing created an obstruction between me and my surroundings. I was in a stunningly beautiful part of eastern Turkey and thought longingly about how magical the road between Hozat and Ovacik must be. Another year, with luck. Between Hozat and the Pertek to Cemisgezek road. After walking about 3 kilometres, two off-duty jandarma kindly gave me a lift to where the road from Hozat joins the road from Pertek to Cemisgezek. Before arriving at the junction, we stopped at a roadside cesme to fill our bottles with chilled water from a pure source in the nearby hills. This entry was posted in Architecture, Travel, Turkey, Turkish Armenia, Turkish Kurdistan and tagged Alevis, Cemisgezek, Dersim, Ergen Armenian Church, Gecimli, Hozat, Ibrahim Kaypakkaya, Kurdistan Workers Party, Pertek by philandre. Bookmark the permalink.